Salla Tykkä (b. 1973) is an artist addressing the relationship of images with power, control and memory. Consisting of three pieces employing the moving image and photographs, Retrospective is her first exhibition at Galerie Anhava. 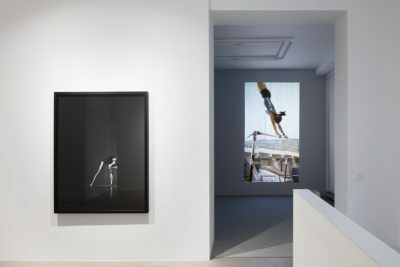 The exhibition and its eponym piece Retrospective (2015) are informed by retrospection and an autobiographical approach. 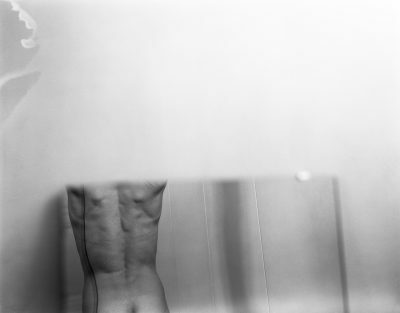 In this work, Tykkä considers the connections of memory and identity by telling about the analogue cameras that she has used in various stages of her life. On the video, the artist assembles and disassembles cameras with her experienced hands. This footage is accompanied by images from a travel diary filmed by Tykkä in her youth on a trip to Patagonia and Tierra del Fuego. We are shown documented clips on 8 mm film, hand-held shots from a rocking boat, dusk in a desert location, and the streets of metropolises. In this collage-like piece, image and the spoken idiom flow along their own paths, with meanings generated through their subtle encounters. Giant (2013) is a short film about young artistic gymnasts practising in the Onesti and Deva boarding schools in Romania. 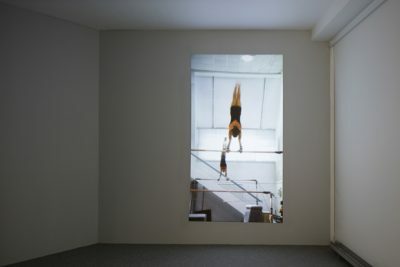 The silent, disciplined practice is contrasted by excerpts of interviews adding the voice of the gymnasts to the piece. Cuts to archive material filmed at the schools and the modernist sports architecture of their gyms include these girls, who remain anonymous, among the traces of the totalitarian regime that ruled Romania. Giant won the Tiger Award for Short Film at the Rotterdam Film Festival in 2014. 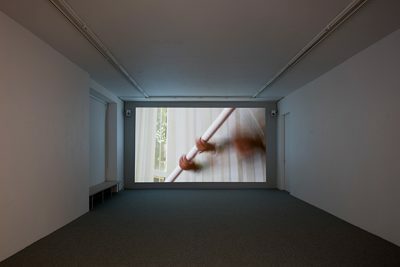 It is part of a trilogy in which the artist explores systems producing the imagery of perfection and their effects on the individual and the environment. 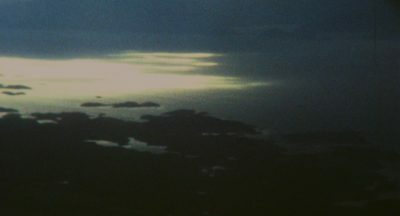 The material filmed in Romania also led to Tykkä’s new piece, Palace (2015). 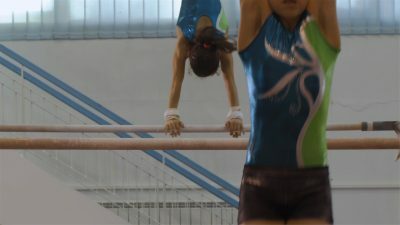 It focuses on the move, or skill, on the uneven bars known as the ‘giant’ in which the gymnast rotates herself 360 degrees around the bar in a straight position with arms fully extended. In this piece, the cyclical motion, in which the gymnast has to resist centrifugal force, is a metaphor of an organized system of gymnastics that is in danger of collapsing along with changes in society. On the sound track, the artist poses questions to coaches, and at the same time to herself, revealing her personal memories and fears attached to this sport. As in her earlier work, Salla Tykkä’s new pieces apply the means of documentary film narrative, but now with a new and central role given to spoken language, bringing the works closer than before to her own experiences. This particularly concerns the ways in which things are said. By alternating distancing and immersive elements of imagery and sound, Tykkä succeeds in entwining the collective and personal dimensions of her multi-layered themes. 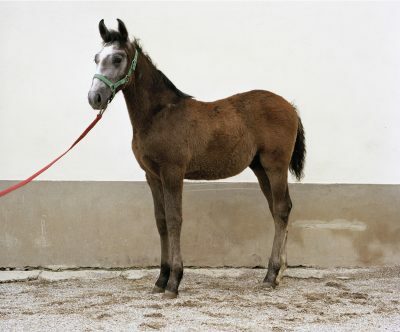 Salla Tykkä’s book The Palace will be published by Galerie Anhava in connection with the exhibition. The book is on the above-mentioned trilogy consisting of Giant (2013), Airs Above the Ground (2010) and Victoria (2008).